If you face random advertisements and pop-ups, you need to inspect if they are not AllSaver Ads. Offers presented by this browser extension are unreliable and should not be trusted at any point. Unfortunately, sometimes only authentic security tools can detect the threat and remove it in time. As it has been discovered during recent research, the application can install itself without permission and computer users may be completely oblivious about its existence. Because the program does not have an interface and does not represent itself when you browse the web, AllSaver removal may be quite complicated. If you do not want to worry about the removal of undesirable software, you need to stay away from these installers, and it appears that they are usually represented on sites related to the P2P file-sharing services. If you are not careful with this, you may end up installing DiscountLocator, Takethecoupon, PriceKeaper, and various other unreliable programs which are capable of flooding your browsers with unreliable ads and offers as well. 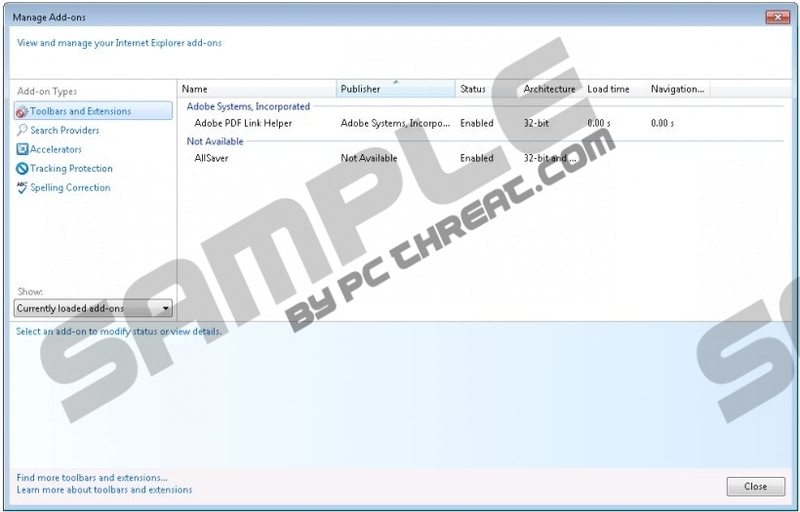 Note that these programs may change their own names, and so even though you need to delete AllSaver Ads, you may find them represented as AllSavEr ads. Advertisement supported programs are created to display random deals and offers which actually belong to third-parties. These are affiliated to AllSaver, and probably support the developers of the program in a financial manner. Needless to say, in some cases software developers care only about the money and not about the services they promote. Unfortunately, this kind of relationship is unpredictable, and you cannot be sure when you will face unreliable ads representing malware installers and other threats. Due to this we advise that you remove AllSaver Ads and use ad-blockers to avoid misleading offers in the future. The removal of adware is extremely important, and so right now all you need to worry about is AllSaver removal. You can delete the malicious threat manually, or you can leave this task to the authentic malware removal software. There is no question which of the two options is more reliable and beneficial; however, the security of your operating system is completely in your hands. Open the Start menu by clicking the Start button on the Task Bar. Move to the Control Panel and double-click Add or Remove Programs. Click the undesirable application and choose to Remove it. In the menu select Control Panel and then move to Uninstall a program. Find the application you wish to delete, right-click and Uninstall it. Quick & tested solution for AllSaver Ads removal.